I receive many questions about wing trimming, so this month I would like to discuss a "new" way to clip pet bird's wings, although I have been using this type of clip for well over ten years now. Many avian vets, breeders and pet retailers still clip the wings by cutting along the covert feathers, beginning at the tip of the wing. This type of trim leaves about 1/3 of the feather, under the level of the coverts (hopefully), if trimmed "correctly." Often, with this type of clip, it is easy to over trim the wings, cutting all of the primary remiges and many of the secondary remiges, as well. No matter what type of trim is employed, it should never be necessary to cut into the secondary feathers (those past the bend of the wing). In addition to cutting too many feathers, resulting in a bird that can no longer glide gently to the ground, this type of trim will predictably leave the sharp cut feather shafts (often cut at an angle, which makes them even more pointy and irritating!) I have often noted that birds that have been clipped in this fashion will often chew on the sharp, stiff cut shaft, trying to "soften" the point. African greys, cockatoos and Eclectus seem to be the most often aggravated by primary wing feathers cut in half. I have no doubt that this type of wing clip has precipitated many a bird to begin a feather-picking episode. If you doubt that birds don't like having partially cut feathers, check your bird's wings. Often the cut shaft has been chewed on, giving it a star-like appearance, almost like the cut tip has "exploded." This indicates that the bird is being bothered by the trim. This wing clip is perfect for all psittacines. It is quite simple, actually, but it does require a bit more attention during the process than the older wing clip. With this trim, I carefully extend the wing, never restraining the wing by the tip (as if the bird tries to flap, it may result in a fractured humerus). Using cat or bird claw scissors that are notched and have rounded edges, I carefully identify each shaft of the primary wing feathers, beginning at the tip, and I cut the feather at the base, where it is just a bare quill, taking care to not cut the overlying covert feather. Since each individual feather is identified before clipping, there is no chance that I will inadvertently cut a blood feather. (A blood feather is an active, growing feather with a blood supply. It is easy to identify by its thickened, soft, purplish shaft. A blood feather will push out the old feather, replacing it). Using this type of trim, I usually only need to clip five feathers on each wing. Strong flyers or light birds may need one or two additional feathers clipped on each wing. I usually test-fly a bird to make sure that it can glide to the ground, and not gain any lift or maintain horizontal flight for any length. It's better to be conservative in the amount of feathers clipped at first, then to clip additional feathers as necessary. Both wings should be clipped symmetrically to ensure that a bird can glide to the ground and not fall like a ton of bricks (this can result in an injured or split keel, or an injured beak tip that can cause excessive bleeding). When a bird extends its wings after this type of clip, you will see no cut edges or ragged cut feathers at all. It is a cosmetically attractive clip, and I feel that it is kinder for a bird. Birds are very fussy about their feathers, and I have seen evidence of birds being frustrated, annoyed or aggravated by cut feathers poking them in the ribs. I have also watched birds engaging in normal preening behavior, grasping a feather at the base, to begin preening, and then sliding the beak up the feather until the bird reaches the cut feather end. It then stops at the cut end to try to "preen" it. It may spend an inordinate amount of time obsessing on the cut ends, which feel abnormal to the bird. However, when a feather is clipped at the base of the quill, there is no feather there at all for the bird to preen, eliminating the problem entirely. There are detractors that do not like this particular clip for one reason or another. One complaint is that this clip leaves the growing blood feathers exposed, making it easy for the feathers growing in to become damaged, resulting in bleeding. If the covert feathers are all left intact (as they should be), they protect the growing blood feathers. The shaft of a growing feather never sticks out beyond the coverts (as I have seen depicted in drawings in some books). I have clipped thousands of birds with this method, and rarely has a bird injured a growing blood feather as a result. Cockatiels prone to night-frights or panic-attack like flapping are more likely to injure blood feathers (however this can occur with any type of clip). Another excuse for not using this type of clip that I have heard is that "I've been clipping bird's wings for 20 years and it (the old technique) has always worked for me." Well, that may be true, but I think it is always important to have an open mind and be willing to change and learn new techniques, especially if the evidence has shown that this might be a better clip that is kinder for the bird. I, too, was taught the "cut the feathers in half" technique a long time ago, but I discovered that this newer technique was far better for birds, in my opinion. I have also heard arguments against this type of wing clip based on the premise that a bird won't molt properly because the feather quills are not heavy enough to fall out during a molt. People espousing this theory need to be taught how molting occurs. The old feather is pushed out of the follicle by the growing new blood feather. "The discarded feather is pushed out by proliferation of the epidermal collar at the base of the follicle.1" So, it doesn't really matter the length of the cut feather in terms of normal molting. A half-feather or a quill will still be pushed out of a feather follicle during the normal molting process. If a feather is plucked out of a follicle, it will usually begin regrowing almost immediately. This is why feathers are not plucked out instead of being cut (also plucking is painful and causes some damage to the follicle). The Association of Avian Veterinarians has a laminated wing clipping chart for sale that demonstrates this newer wing clip. It is meant to be displayed in veterinary clinics and other places where wing trimming is performed. I do not recommend that beginners and bird owners try this (or any type) of wing trim without being taught by someone familiar with restraint and bird grooming. 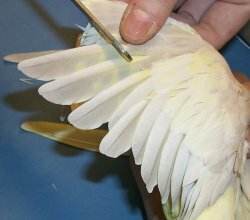 Wing clipping is a very important part of pet bird care, as it prevents many types of accidents and the escape of a bird by flying away. I hear almost daily about birds that have flown away through an open door or window, or off of an owner's shoulder. I always recommend that a bird be retrimmed when two feathers have grown back in where they have been clipped, or when an owner notices that a bird can glide horizontally for some distance. However, even if properly trimmed, a startled bird, or one outdoors exposed to any breezes, can end up at the top of a tree. A bird taken outdoors should always be kept in a bird cage or harnessed to prevent accidental escape. I have seen some poor birds with virtually all of their primary and secondary wing feathers cut off. One poor Amazon named Custer comes to mind. The owner drove quite a distance to have her beloved pet groomed at a veterinary clinic, where, in my opinion, the wings were butchered terribly. Custer's wings will take over a year to grow in again so they can be trimmed correctly, and all of the damage was done in one thoughtless moment. Some people have never been taught any of the correct ways to trim wings, although, in my opinion, this is no excuse. Anyone offering this service to clients should learn how to do it professionally and correctly. Of course, there are other methods to trim wings (leaving the end two primaries, trimming one wing, etc. ), but I truly feel that the clip that I have described here in detail is the best one for most pet birds. 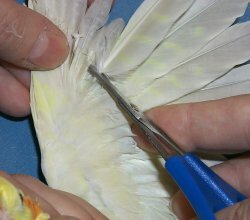 If you have observed that your bird has wing feathers cut off 1/3 or ½ way down (especially if the cut ends appear ragged or chewed), consider asking your vet or whoever grooms your bird, to consider trying this method of wing clipping. If they are reluctant to attempt this method, perhaps they are not as progressive and open-minded as you would like. After all, it is your bird, and you should have the choice in how your bird is clipped. Traditional way - Not the correct one . This demonstrated the traditional way a bird's wings can be clipped. The feathers are cut along the level of the covert feathers, at an angle, leaving sharp cut shafts that can irritate birds. Scissors with sharp points should never be used to trim wings. I do not employ, nor do I recommend, this type of clip.